If you’re the type of person who still has difficulty operating a video recorder (and I know I am), then you’ll adore Mon Oncle. 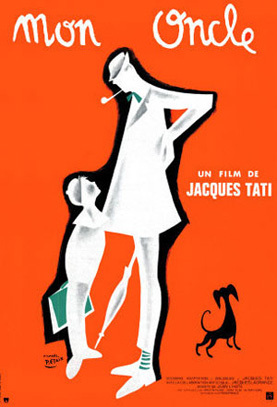 In it, the much loved French actor/director Jacques Tati revived a character that he created in his second feature film and developed in a further three; Monsieur Hulot, an affable, if slightly befuddled, pipe-smoking chap at one with his quaint and quirky lifestyle. His daily routine includes adjusting the window of his rooftop apartment to reflect sunlight onto a neighbouring canary so that it warbles away chirpily, brightening up the whole district. It’s a jolly old world Monsieur Hulot inhabits but when he comes up against a modern environment such as his nouveau riche sister’s ultra flash home, he finds himself all a dither. Full of new-fangled appliances like a huge silver fish fountain that squirts blue water on demand – a feature reserved only for special guests – Madame Arpel’s home is anathema to Hulot, as indeed it is to his nephew Gerald (Alain Becourt) and the family’s dachshund. Together they escape to the streets where kids play havoc and adults find themselves lured into cafes for one more round. Plot driven, this film is not. In fact, there is hardly any dialogue at all. Like Charlie Chaplin before him and Jerry Lewis afterwards, Tati uses slapstick and clever sight gags to entertain his audience. He frames his shots wide, choreographing the action within to animate the scenes with endearing results. When the grotesque neighbour drops by with her matching thatched hat and handbag, we watch her clip clop along the ridiculously windy garden path, marvelling at the minimalist architecture that, like Dorothy, she’s somehow landed herself in. It’s a gentle but effective examination of the absurdity of modern nuclear families compared with the wonderful randomness of extended life outside those mechanised walls. The universality of its theme won Mon Oncle an Academy Award for Best Foreign Language Film as well as the Special Jury Prize at Cannes. With it’s whimsical look at the often futile nature of adult endeavour, this film still delights children while also amusing their parents, aunties and uncles alike.